The established fantasy sports brand is expanding into the real sports betting territory. The FanDuel Sportsbook has launched in New Jersey and is among the very first online sports books in the United States. Read our review of their promotions and services. The FanDuel brand established itself as a predominantly fantasy sports betting platform since 2009. The brand quickly became one of the largest players in the multi-billion dollar fantasy sports betting industry and is currently considered to be a go-to by most fantasy players. With the change in betting laws enforced by the Supreme Court earlier in 2018, FanDuel has now set its sights on the sports betting industry. 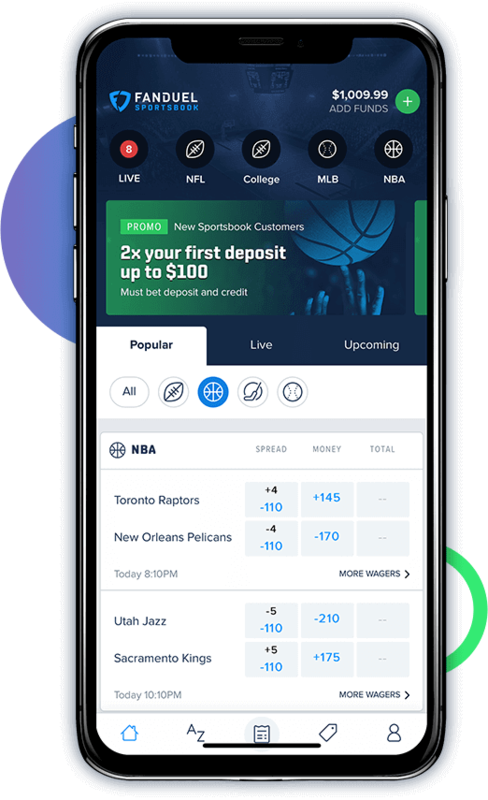 With an already strong foothold in the industry, Fanduel Sportsbook is in a fantastic position to become one of the first and most popular sportsbooks to hit the United States. From what has already been disclosed, users can expect top betting odds, future betting lines, and live in-game betting with options to make parlays and teasers, which can all be accessed from your phone. Bettors can also expect a Welcome Bonus on registering to the FanDuel Sportsbook that should rival the best sports betting platforms in the area. With the huge amount of competition and focus on the emerging sports betting market, you can expect FanDuel to stand out from the pack with a generous signup bonus. You should keep in mind that certain conditions will coincide with any sign-up offer. Be sure to read through the terms and conditions of your bonus offer thoroughly before attempting to claim the bonus. FanDuel has already produced great sports betting apps for their online sportsbook product. This includes both a browser-based client which will be available to use without any download required and a mobile app for both Android and iOS device. Check in at the iTunes and Google Play stores to find their app. FanDuel has already created a reputation for providing great fantasy sports betting opportunities for the NBA, NFL, MLB, and NHL. This trend continues in the sports betting portion of the platform with a variety of promotion codes, prop bets, live bets, and standard line bets available for each league. Find other less popular international sports such as Soccer, Tennis, Cricket, Rugby and Aussie Rules to begin to make appearances over time too on the FanDuel Sportsbook. Right now, FanDuel Fantasy sports is available in many states. However, the Sportsbook is limited to New Jersey. But if you want to play FanDuel has currently set up a notification system to ensure you don’t miss out on any updates on content and offers. The system will also notify you when the FanDuel Sportsbook is available in your state. The FanDuel Sportsbook is poised to make a great run in the United States sports betting market by starting in New Jersey. With an established name in the fantasy sports industry and years of experience catering to stats-heavy, fantasy-loving Americans, FanDuel should be able to make a strong first impression with bettors and create a top sportsbook experience rivaling the industry elites. To keep up with every development and the details on any Welcome Offer that may be available with the release of FanDuel be sure to register for FanDuel Notifications. Get back to this review to make sure you don’t miss out.